New residents of Utah's ski havens of Park City and Salt Lake City say they came for the winter and stayed for the spring and summer. I got a taste of what they meant on a trip there this month. The spring is arguably the best time for a recreational skier to visit a few of the seven ski resorts within an hour of the Salt Lake City airport. There's still snow on the ground, but lodging prices are much lower than in peak season. For example, a room at the exclusive, ski-in/ski-out St. Regis at Deer Valley starts at $199 a night instead of $599 during the height of winter. The rate for a king room drops from $750 to $550 at the Washington School House, a newly renamed and revamped luxurious boutique property that is a stone's throw from the action on Main Street (and ski-in/ski-out from Park City Mountain Resort). That includes a fine, home-style breakfast and all the après-ski snacks, microbrews, and wine you'd like – a rarity in this resort town. Plus, even when the snow isn't as powdery as you'd like, there is a myriad of other outdoor activities at your disposal within an hour's drive. 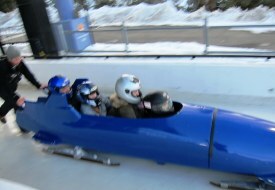 Because it's not uncomfortably cold, you can zipline 2,111 feet over a snow covered Canyons Resort without fearing wind burn; take an 82 mph bobsled ride at Utah Olympic Park without numbing your fingers (pictured at left; available through March 17); and take an evening snowshoe trek to a well-deserved, on-mountain dinner with All Seasons Adventures without feeling frostbitten! And when you want a taste of the big[ger] city, you can head a half hour west to Salt Lake, which is experiencing a boom of new museums, shops, and funky restaurants (try Mediterranean tapas at Eva and vegetarian specialties at the Copper Onion, both downtown). Salt Lake's Natural History Museum, which celebrates Utah’s native peoples, cultures and extraordinary ecology, opened in the fall, as did the Leonardo Museum, which gives visitors the chance to rub shoulders with working scientists, makers, creators, thinkers, philosophers, and artists in immersive exhibits, labs, and community workshops. For $24, you can get a Connect Pass for admission to 13 city museums and attractions. Next week, the multi-billion-dollar City Creek Center will debut, bringing 700,000 square feet of high-end shopping like Michael Kors, Tiffany & Co., Brooks Brothers, and Rolex under a retractable roof downtown. The springtime fun doesn't end there: I drove an hour south of Salt Lake for a five-mile round-trip hike on a snowy and icy trail in a t-shirt (how cool is that?) to the Fifth Water Hot Spring in Diamond Fork, where several natural pools of varying temperatures offered restorative relaxation after several days of skiing, touring, adventure, and shopping. As I sat in the pool watching local hikers trade their snowshoes for swimsuits, I realized I hadn't missed out by coming to Utah at the tail end of ski season. I'd come at the perfect time. For general trip-planning info, see our Utah and Park City destination guides.